Enriched with therapeutic Dead Sea minerals and nourishing Ginseng extract. A multi-use leave-in hair styling cream that defines the modern look with an effortless, balanced finish. 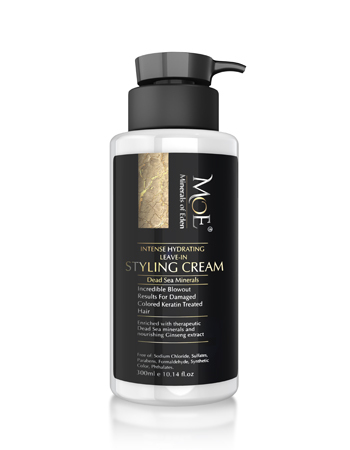 MofE hair styling cream is a remarkable combination of Dead Sea minerals enhanced with several other natural oils with expressed hair care properties. Our original MofE hair styling cream is formulated with Dead Sea ingredients rich in minerals, antioxidants and vitamins to smooth and soften the hair texture. Perfect for creating different hairstyles, the styling cream can be used alone to add texture, or in conjunction with heat styling to achieve enhanced body and volume. Water (Aqua), Cetyl Alcohol, Cetrimonium Chloride,Mineral Oil, Aloe Barbadensis Leaf Juice, Petrolatum, Phenoxyethanol, Ethylhexylglycerin, Panax Ginseng Root Extract,Dimethicone, Butyrospermum Parkii (Shea Butter), Argania Spinosa Kernal Oil, Macadamia Ternifolia Seed Oil , Linum Usitatissimum (Linseed) Seed Oil, Sea Salt (Maris Sal/Dead Sea Salt), Aroma, Lanolin, Isopropyl Myristate, Citric Acid. Truly the most incredible styling cream I have ever tried. My hair stayed picture perfect for days.